Some of you might have seen the "Creating a Game" article series on our website. It consists of 11 entries at the moment this text was written. The entirety of Petigor's Tale is based on these articles. After completing the work on the location described in the articles (the lava islands), we decided that we didn't want to stop there and that we simply must carry on with the story. Thus, the "Dungeon", another location which has a much higher level of detail and lots of special effects, was created along with a prologue that is very high in content and can be viewed when starting the game. In addition to that, the model of the main character was replaced, a real menu system (we're sure you will find it highly convenient) and sounds were added and the gameplay was also updated. Level selection menu made fully in 3D. The prologue intensively uses almost all the features Blend4Web currently has available. Aside from the high quantity of graphical content and animations, all the might of our logic node editor is at use here. The opening scene has almost no programming at all! A small part of of the Intro scene logic node tree. You really have to watch the intro scene that explains what has happened to Petigor and why he must fight golems in the flaming mouth of the volcano. It will allow you to feel the game's atmosphere more deeply, to immerse yourself in the fairytale world of the game and will also introduce to you the inhabitants of this world. Petigor slays a golem, and it crumbles to pieces. The gameplay itself hasn't changed much, although it still has some new features. 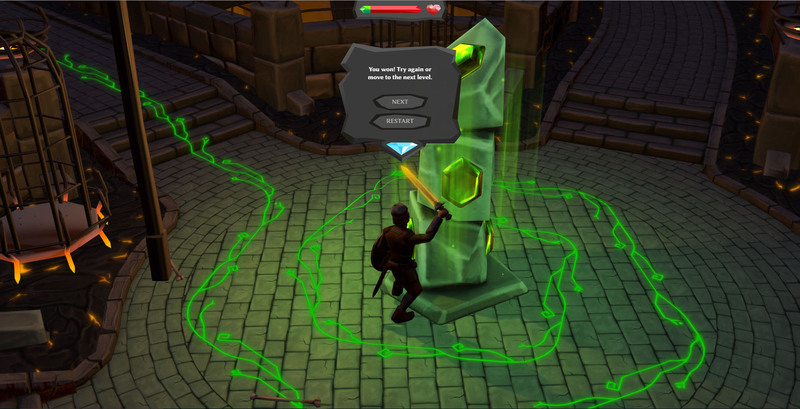 Playing as an agile and brave warrior, you must fight enemies that leave magic crystals upon their deaths. By collecting these crystals, you can activate magical obelisks and move on to the next location. A new type of half-cooled golems inhabiting the second level. In the second level, you will encounter two types of golems, the environment being significantly different from anything you might have encountered on the lava islands. The dungeon has many walls and other obstacles which don't merely interfere with your progress, but also can be used to hide from enemies! The second level is a dungeon, or to be more precise a prison. To make controlling the character simpler, we decided to add mouse support and to completely rework the user interface. Now, the game is not only interesting, but much more convenient to play as well! We especially want to mention our main character. Petigor has matured and aquired new equipment and his face now looks different. Now, the golems ain't no match for him, and he can challenge even the evil troll! You can compare both old and new models in the picture below. An old character model is to the left, a new, changed in accordance with an extended world, is to the right. Despite enormous amount of work that has already been done, we plan to add some more changes to the Petigor's Tale. For example, the final level of this story, where Petigor will face the master of the dungeon, is already in development. Also, we want to update some of the game elements and the gameplay itself. The game now has a dedicated web site that will soon be filled with various interesting content. Be expecting updates! This is how we make applications here in Blend4Web. And at last we want to mention what might be the most important thing regarding the whole project. As we are the die-hard Open Source supporters, we decided that Petigor's Tale should be a completely open project! So you can find all the source materials in the free Blend4Web SDK that is already out. Facebook page dedicated to Petigor's Tale. Pretty cool :) Any tutorials on the way about how to do something like that? The game itself plays pretty smoothly and the graphics looks great for web :) I can't wait to see any updates and tutorials (without coding). Yes, we planning to continue making tutorials, also you will find some common words about making of this scene on our conference in may. Stay tuned. Congratulations guys, the game is a spectacular achievement! I am looking forward to future releases and an open source Webby Graphical future!